Customers do not need to have a Paypal account to pay. They can pay by credit card too. PayPal will give customers the option to pay by credit card if they don’t have a PayPal account. PayPal normally figures out if you have a PayPal account or not from the cookies on your computer. 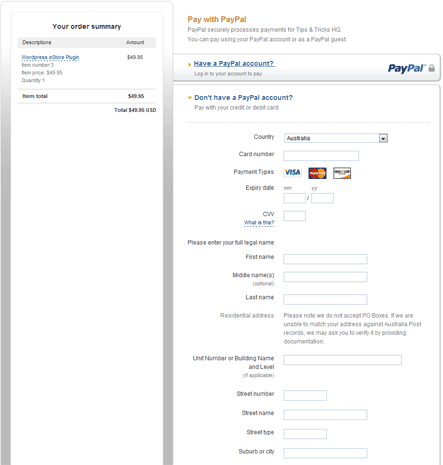 Try deleting all the cookies and hit the checkout button to go to PayPal and it will present you with the option to pay by credit card upfront (similar to the screenshot below). If you have issues with your paypal or credit card request email us at [email protected] OR request an invoice to the same email for paypal or credit card processing, and a member of the sales team will get you squared away shortly. You MAY need to use an e-mail address NOT associated with a Paypal Account. Afterwards please fill out all appropriate information as usual.